The most fundamental fact that applies to all spending by a public organisation is that it is spending public money. The spending has to be able to withstand scrutiny, from Parliament and from the public. Sensitive expenditure is spending by a public organisation that could be seen as giving some private benefit to an individual staff member that is additional to the business benefit to the entity of the spending. Policies, procedures, and other controls for sensitive expenditure should be embedded in the public organisation's philosophy, practices, and business processes, rather than be viewed or practised as a separate activity. When they are embedded, everyone in the organisation becomes involved in the proper and prudent management of sensitive expenditure. In our view, responsibility rests with those “at the top” – the leaders and senior managers – to make it clear to staff what is and is not acceptable sensitive expenditure for that organisation, and to model that behaviour to the highest standard. Leaders and senior managers, from both corporate governance and management, need to ensure New Zealanders have trust and confidence in their public organisations. Public organisations are responsible for taking a principles-based approach to sensitive expenditure. This approach provides more flexibility and is more enduring than prescriptive rules. are appropriate in all respects. These principles are to be applied as a set. None should be applied alone, and none should be treated as more important than another. 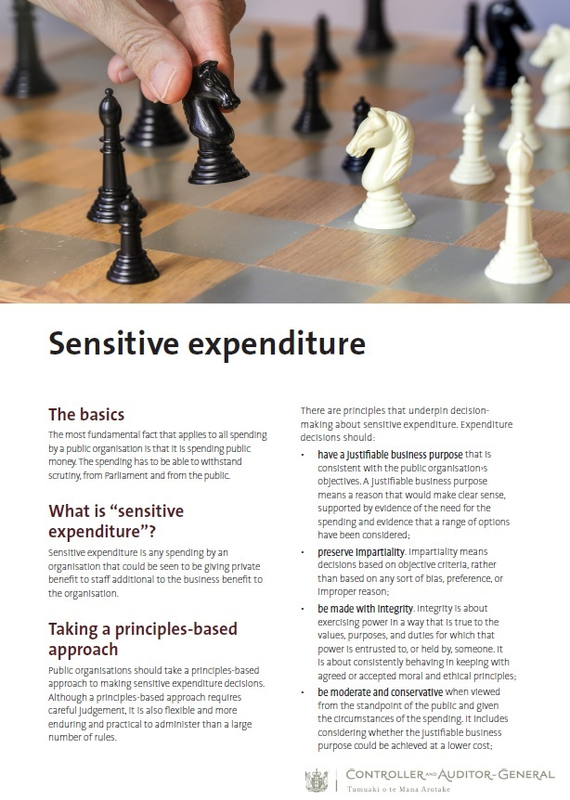 For more information, see Part 2 of our good practice guide on controlling sensitive expenditure.